The kids love to play pretend and mix things together, so today I made kool-aid salt sand and we did pretend ice cream shop play. All you need is salt, kool-aid and a little water. I mixed 26oz of salt and packet of kool-aid and couple teaspoons of water(not too much) you don't want it runny. Then the kids had bowls and scooper's and went to town. I also gave them some sprinkles to add to the ice cream play. Then after alittle play, I took out the silicone ice cream cones and they played with them. Hours of fun play for very inexpensive, plus they are using their imaginations for play. "J" pretending like he was going to eat the ice cream. They loved playing pretend ice cream shop. If you like this you might want to check out these links listed. 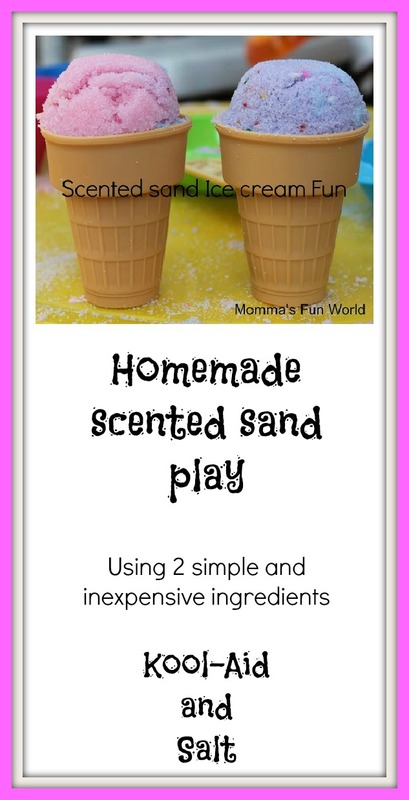 Couple others ways to make sand with salt Home made chalk sand and Glowing sand . Also, please feel free to share would love to see the fun you are having as well. What a neat idea! I am sure the kids love the fun addition of scent to their play sand. Super fun. Oh, what a fun idea!! Thank you for sharing on Sharing Saturday!! This looks like so much fun. I definitely want to try it with my girls. We can't get Kool Aid in Australia I wonder whether jelly crystals would be a good substitute. If you don't have kool-aid you can use chalk as well for the color(just chop it up real fine) and add alitte water or food coloring. It was alot of fun and the kids had a blast.